Anyone who enjoys food will love Sal del Mar’s gourmet sea salt and the rustic, intense flavor that makes it ideal for every day cooking. Harvested from the Sea of Cortez, it is a coarse moist salt that offers a healthier and cruncher experience. 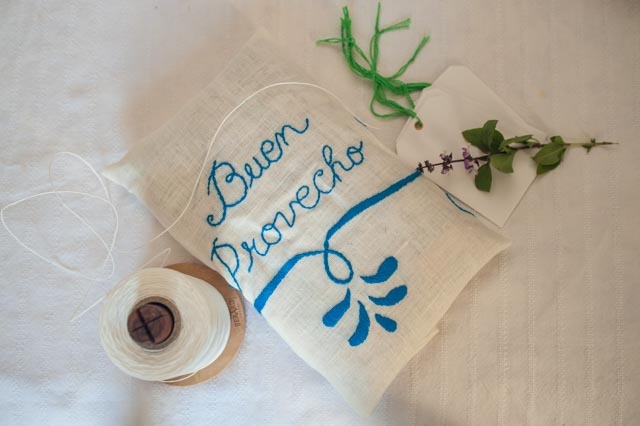 AND it’s already “wrapped” in a hand-embroidered bag crafted by the women in a small village in Sonora, Mexico who benefit from the sale of the bags. Each towel is a work of art. . . so the Buen Provecho (Spanish for “I hope you enjoy your food) design makes the prefect gift for Foodies to use to hang in their kitchen to bring themselves joy or to use to enhance a gift to another “foodie” when you want to give them a copy of your favorite cookbook. This isn’t any ordinary tea towel. It is not only hard-working (it can wipe up the spilled ketchup), but it can be used as a napkin or to wrap a bottle of olive oil as a gift for your favorite foodie on your list. The beauty also lies in knowing it is hand-embroidered by the women in Sabanito, Mexico who help to support their families while staying at home to take care of their children.